This annual blog post has become a favorite because I’m sharing MY favorite reads from the year!!!!! 2017 has been a wonderful reading year. I’ve added several new all-time favorite books to my “shelves”, met some amazing new authors both through their books and on social media, and been blown away by story multiple times. At latest count, I’ve read 58 books! Whew! Comparing genres, I’ve read quite a few more contemporary stories versus historical, and my list here is representative of that slant. Most of these books were published in 2017, but a few were new discoveries I can’t believe I waited this long to read! But first, some ground rules: in an effort to NOT be long-winded and wordy, I’m choosing to share 3 things that describe each of these stories along with a link to Goodreads and my review. (Click each title to visit Goodreads). Honesty. The Sound of Music. Humor. WHEW! That’s it! These favorites are ones I can highly recommend and gush about for days. Have you read any of these? What are your favorite books of 2017? If you have a favorites blog post, share your link in the comments! Author Laura Frantz returns to her Kentucky roots with her new novel A Moonbow Night. Laura Frantz is on my #mustread author list because her stories always paint epic pictures of individuals in American history in a prose-like, lyrical, immersive style. If I may apply the topographical wording of “north northwest” to the genre, this novel is “historical historical romance”, with slightly more emphasis on the drama and history, though the romance that unfolds slowly is heartfelt and central to the story. After fleeing Virginia, Temperance Tucker and her family established an inn along the Shawnee River. It’s a welcome way station for settlers and frontiersmen traveling through the wild Cumberland region of Kentucke–men like Sion Morgan, a Virginia surveyor who arrives at the inn with his crew looking for an experienced guide. When his guide appears, Sion balks. He certainly didn’t expect a woman. But it is not long before he must admit that Tempe’s skill in the wilderness rivals his own. Still, the tenuous tie they are forming is put to the test as they encounter danger after danger and must rely on each other. With her signature sweeping style and ability to bring the distant past to vivid life, Laura Frantz beckons readers to join her in a land of Indian ambushes, conflicting loyalties, and a tentative love that meanders like a cool mountain stream. A Moonbow Night is as prolific and flowing as expected, with a new level of grittiness exploring the raw reality of frontier life, conditions, and conflict. Instead of typical plot and story, Moonbow offers what feels like an inside look at true frontier living. The monotony, the labor, the wild beauty, the challenge. The toughness of character required. The trust in the Almighty and fellow man. And, the sweetness of love and family which surpasses all eras. Sion is a hero of few words and many actions. His steadfast presence is an anchor to the story, dependable for Tempe whose life seems ever-changing. Tempe, a strong character herself, is good at the heart and willing to do anything necessary for the people she cares for, whether it be family or a rough group of surveyors with a formidable 🙂 leader. This story delves deep into the heart, revealing slowly an intricate picture influenced by grief and love. While the reader doesn’t know the backstory of Sion or Tempe for a little while, one can still sense the pain in each character’s voice and wonder at what happened. Patience is rewarded as Frantz reveals the acts behind each character’s carried heartache and brings to light surprising secrets connecting this ragtag group of characters in unexpected ways. While they traverse many trials and crazy-dangerous situations in the wilds of “Kentucke”, some making me anxious and wondering how any good could come from the current predicament, the magnetic draw between Tempe and Sion was unmistakable. This is, perhaps, my favorite part of this story: the bittersweet romance between them. Slow to manifest itself, I was constantly rooting for them to see beyond their own pain and realize the blessing and life found in each other. Their eventual path to this realization surprised me in several ways, but it offered a thread of hope, of purpose, tying the story together and pointing to God’s ultimate plan and provision. Thank you to Revell Publishers for the complimentary review copy of this novel. This review reflects my honest opinion. 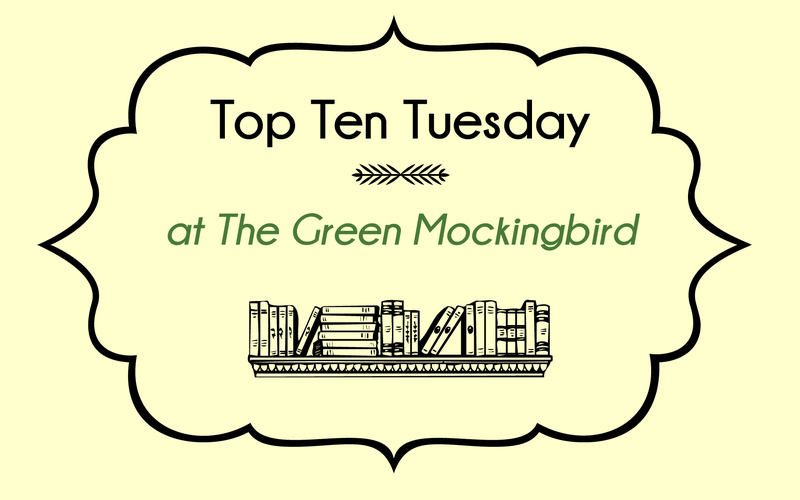 Top Ten Tuesday: 10 Books Set Outside the U.S.
Today’s topic sounded like a fun thing to talk about, especially for this native southerner. While I have traveled a bit within the US, I’ve never been out of the country. What better way to learn about another culture or experience another location (without actually going) than books? For today, let’s “pack” our suitcases and talk about books set outside the U.S. For fun, I’m splitting this list up into 2 types: books I’ve read and books on my TBR. 10 Books Set Outside the U.S.
1910s Toronto, Canada (and Chicago). What could be next for these daring girls? Italy (and Atlanta). It’s by Katherine, so I KNOW it will be good. Oxford, England. This was first added to my TBR solely because of the cover. Since then, reviews of Kara’s work have completely convinced me I need to read it! What places do YOU like to visit through the pages of a book? What are some of your favorite books set outside the US? This week’s topic is open-ended: 10 reasons you love _______. So, I’m taking the opportunity to ramble in delight over period dramas, whether they be film, television, or series productions. The Young Victoria. So many amazing costumes! As a fan of both history and historical fiction, what better way to combine story and facts than a period drama? Style HAS certainly changed over time, and it’s fascinating. I’m thankful to live in a modern era where comfy pants are acceptable. But I love seeing the elegance and class of past eras. And cravats. Need I say more? Essential to enhancing a story, if you ask me! I spent a previous topic talking about some of my favorites. Series, movie, miniseries. All great for different reasons. Books + visual representation of setting + amazing casting = perfect recipe for a perfect period drama. The Bennett sisters…. I love the way they are portrayed in P&P 2005! For some reason, period dramas tend to have a better grip on relationships — or at least they emphasize them. And I’m not talking about romantic relationships, but friendship, sibling, or parent-child ones. Think Anne and Diana in Anne of Green Gables, or the Bennet sisters in Pride & Prejudice, or the closeness of Jo March and Marmee in Little Women. Maybe it’s because our life is more complex now due to technology and travel, but fewer modern stories can emphasize and portray relationships with such gravity. Heath Ledger & Mel Gibson in “The Patriot”. A favorite film set during the American Revolution. Call them chick flicks if you want, but I am a huge fan of love stories. And classifying a production as a period drama almost guarantees some part of the story will involve characters finding love and, hopefully, happiness. Which brings me to…. Yes, I’m aware that not every period drama ends with a happily ever after scene. And that’s ok, I still like some of those! But I’m a sucker for a good ending. Or at least one that offers hope and maybe leaves you wondering about the rest. Mystery, suspense, war, drama, romance, comedy, true stories. North and South 2004. Drama, love, & social commentary in my favorite miniseries. A little item, yes, but SO important. Language and vocabulary are two more things that have changed so much with time. It’s so interesting to be reminded how people spoke. Henry Tilney & Catherine Morland in Northanger Abbey adaptation. And, sometimes learning new words is a fun bonus! Examples: Plimsolls, quixotic, taciturn. It’s your turn! Why do YOU like period dramas? Or do you prefer another genre of film/TV? Please share your thoughts below! This week is a freebie topic! I’m choosing to go with books I wish someone would make into miniseries, TV series, or movies. So, make yourself some popcorn and read on for my ideas! It should be no surprise to see this on my list. Favorite. Series. Ever. And a miniseries would be awesome, yes? This is another that fits the TV series format! Though the 6 books could be a series of movies, too, what with each sibling having their own book. In the vein of The Book Thief or Woman in Gold, this would be an excellent historical drama on screen with 2 intertwining stories — present day and WWII. Besides this being a great story, it made me want to go to Scotland. If it were made into a movie, I might not actually have to go there to see all the wonderful locations referenced in the story. Plus I’d like to see a cast with the great chemistry of James and Andrea (with Henry Cavill, of course). With a large cast, this would be a fabulous family drama with flashbacks to the early story of a couple certain characters. It would be a perfect June Hallmark movie! Who doesn’t love a good Regency period drama with mystery and romance? With the right casting, it could be a new favorite! Because the world needs more good rom-coms! Why not one with realistic characters, a serious story of forgiveness, and small-town charm. Well, that’s my list for now. How about you? Do you have any favorite books you’d like to see adapted to film of some kind? Share in the comments! Happy (almost) New Year! I want to wish all of you a blessed year. I’m so thankful to be celebrating a new year and being partway through my fourth year of blogging. It’s a pleasure to “meet” with my readers and chat about books and the grace of Jesus. I can’t believe it’s time for another year-end recap! Though much has transpired in 2015, this post will focus on books. It seems like just a couple months ago I was considering my books from 2014 and looking forward to new releases in 2015. In this post I want to share my favorites I read this year. Hopefully you’ll find some titles to add to your TBR — and share your thoughts in the comments! I came really close to my goal of 50 books — I made it all the way to 46 books. (46 and a half if you count my current read). And, I checked off all but 3 books from my personal 2015 reading challenge. This one is a classic for good reason. Plus there’s the BBC miniseries adaptation that is wonderful. The best part about the novel, in my opinion, is seeing both Margaret’s and Mr. Thornton’s side of the story. I really enjoyed this one! Participating in the read-along made this one even better with all the analyzing that went on. A great finish to this series! I was caught up in the intrigue and romance from the very start. Lori is just awesome. She writes beautiful characters and prose with great depth. I’m super excited for the sequel in 2016! Ah, Jessica Dotta is amazing. This is possibly my favorite series of all-time! (And I don’t say that lightly). I have more plans to discuss these on the blog in 2016. Look out, world. I was so glad to read Amelia’s story! The Christiansens feel like my own secondary family at this point. A story for book lovers. Enough said. SOOOO good. And unexpected. And comical. And deep. This one made me want to go to Scotland!!!! Fun, emotional, and characters with great chemistry. An epic romantic story focused on the importance of family, redemption and the choice to forgive. Move over, Nicholas Sparks! This one was a delightful twist on a fairy-tale that had me hooked! And craving coffee. I literally laughed out loud at this one. But it’s more than a comedy — it’s a sweet story of family and learning to trust God. Whew! That was fun to put together. If you’re interested in what other books I read in 2015, check out my Goodreads challenge page. What made it onto your list of favorites in 2015? Did you read any of these? What is on your TBR for next year? This week’s topic is actually top 10 most anticipated releases for the first half of 2016…but since that was a bit challenging for me to do, I’m changing it up slightly. So we’re going with the whole year (because some of these don’t have release dates) and 11 titles. After the cover alone inspired this novella, I have to read this one. The prequel novella won me over! This one will be read soon. I’m anxiously awaiting these stories about the other 2 brothers after Falling Like Snowflakes. You probably know my love of Dawn’s Everstone Chronicles series already. This one is likely book 4! Part of her Pathfinders series, whatever transpires, this will be epic. Not sure of a release date here, but after a fabulous series debut, I’m excited. What about YOU? What 2016 releases are you anticipating?